was 30" along the long side. The short sides measure 21". of the last row was 16". larger and use it for a shawl. ROW 1: Ch 4, 4 dc in 4th ch from hk. Ch 3, turn. ROW 2:Dc in same st as beg ch 3, dc in each dc across, 3 dc in last dc. Ch 3, turn. 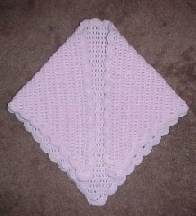 REPEAT ROW 2 Until Kerchief is desired size. 4 Dc in same st as beg ch 3, * sk next st, sc in next st, sk next st, 5 dc shell in next st.
Rep from * around. Join with sl st in top of beg ch 3. TO WEAR: Place the long side of the kerchief around the face and tie the two corners either under your chin or at the back of the neck.